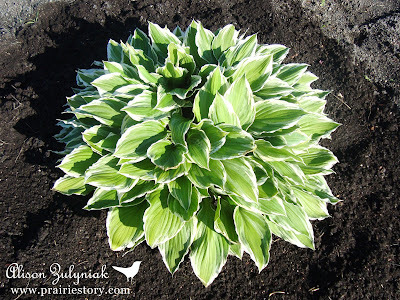 I don't know why I have a bad attitude towards Hostas. I've have even caught myself subconsciously trying to kill my Hostas by tilling over them, ignoring them, letting my dog pee on them and welcoming deer, rabbits and other critters to come nibble on them for a snack. But, I must say, my Hostas are big and beautiful this year! I may be turning a new leaf in my relationship with my Hostas. This is one of my many Hostas and I believe it is a Diamond Tiara which features dainty spikes of purple bell-shaped flowers rising above the foliage in mid summer. It's attractive textured heart-shaped leaves remain green in colour with distinctive white edges throughout the season. They grow to be a dense perennial with tall flower stalks held atop a low mound of foliage. Clearly it is a low maintenance perennial, if it's survived the abuse I've put mine through!